A sci-fi showdown of one of pop culture’s most iconic Alien. 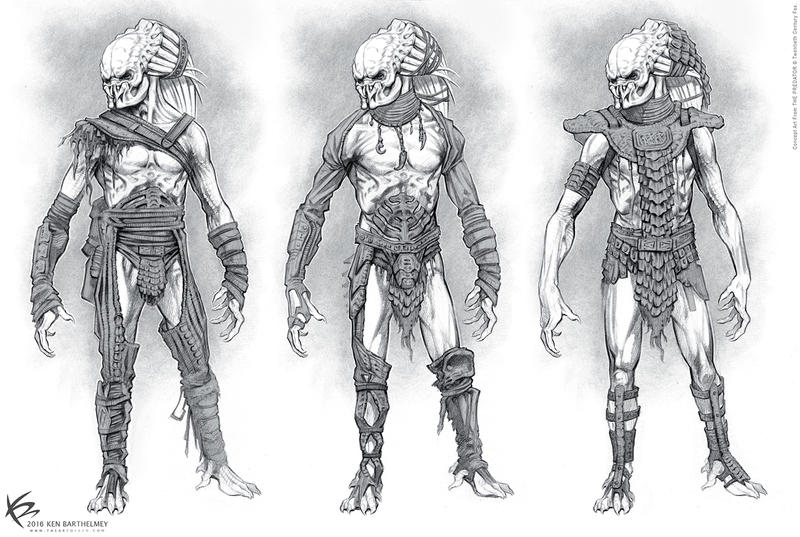 I was fortunate to work on some very early concept work at Studio ADI. In Shane Blacks new film the Predator gets an upgrade with DNA from other species. The universe’s most lethal hunters are stronger, smarter and deadlier than ever before. And only a ragtag crew of ex-soldiers and an evolutionary biology professor can prevent the end of the human race. 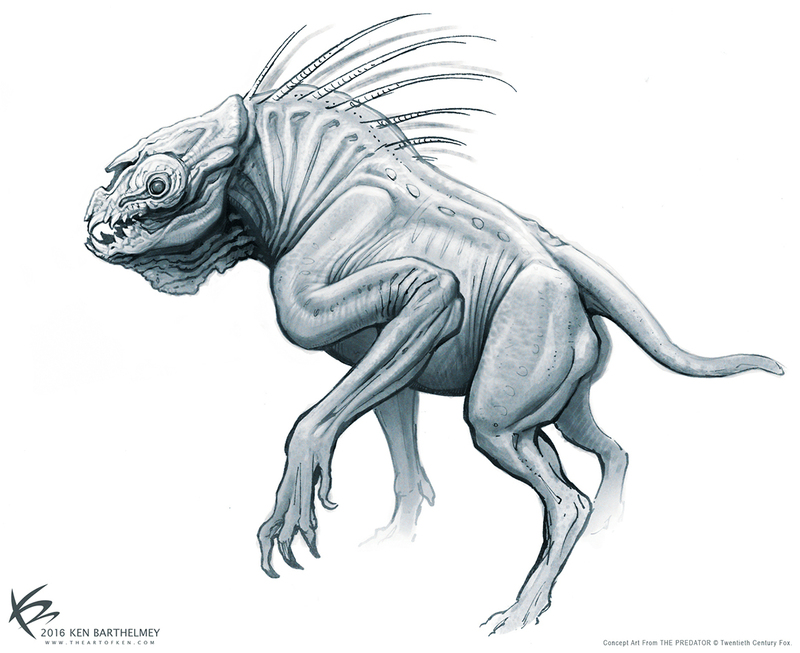 The dogs are about 6' tall Attack/Hunting creatures that work with the Preds. They had to look vicious, powerful and cunning. Even though they didn't make it in the film, it was great fun to work on them. 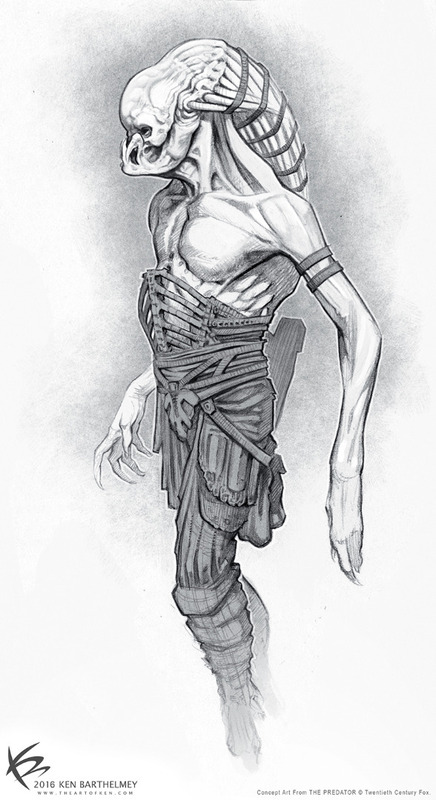 The Emissaries are the intellectual class of the Predator homeworld. They are NOT hunters and don't wear armor. 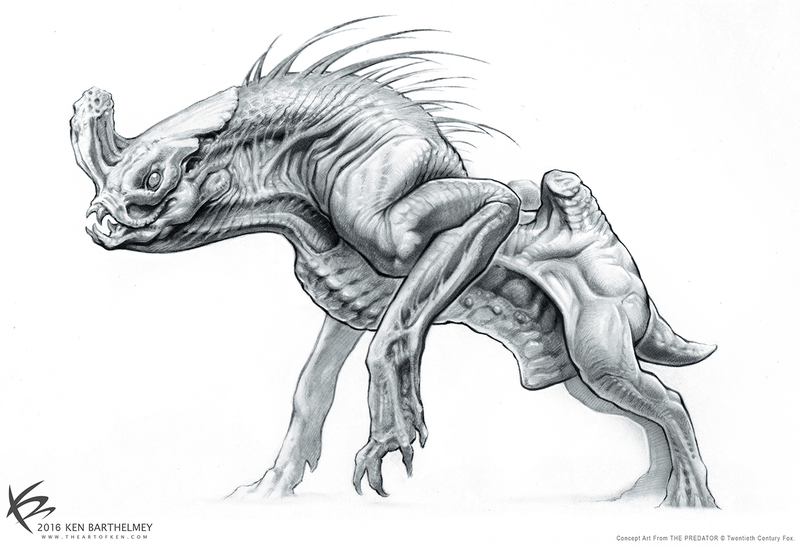 They were supposed to be brainier, leaner of frame and less aggressive looking than the big Hunter/warrior Predators. 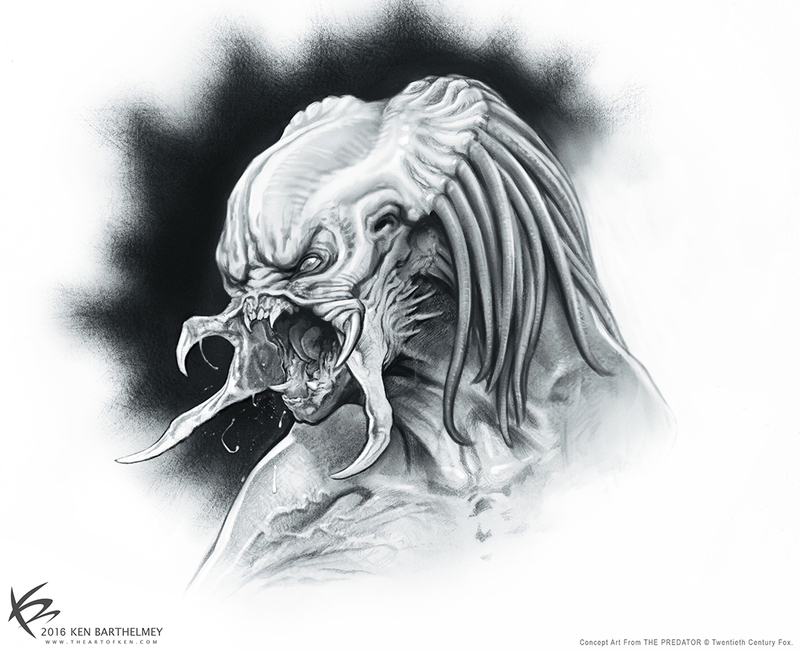 I thought this was a great opportunity to come up with a new looking Predator design. I gave them a more domed forehead and a bony face. 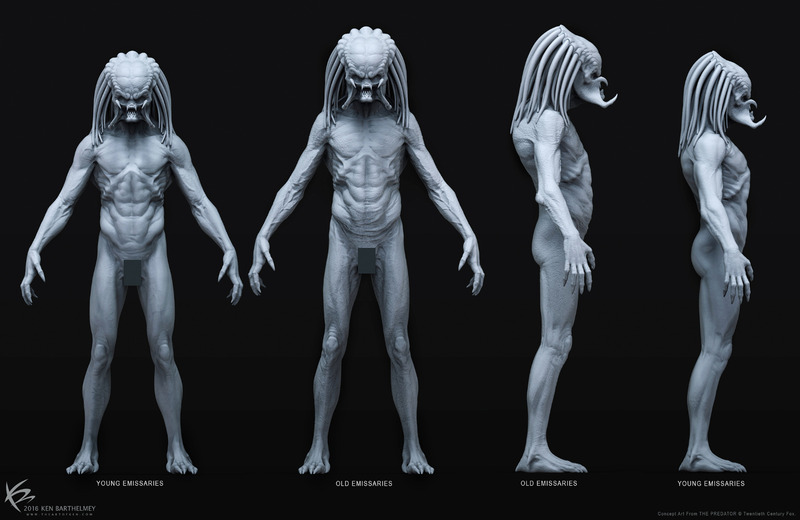 I also came up with the idea to bundle the dreadlocks, which gave the head an interesting shape. The black leather cape made it look more like a higher class citizen. Other costume option. The goal was to add some clues of their culture into the outfits. 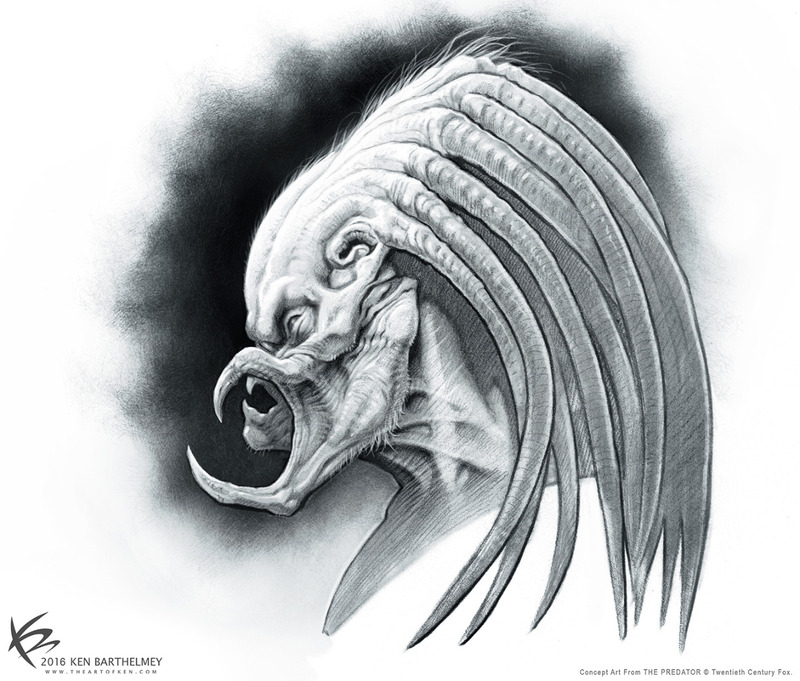 The Emissaries are scientists that build the tech for the warrior Predators. I experimented with a few different outfits that also convey functionality. More outfit options. 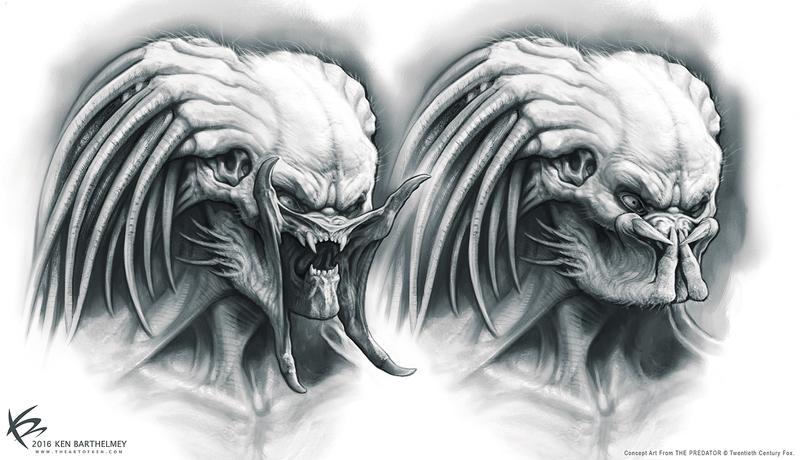 The director felt that the previous face designs looked too far off from what we think of a Predator, so I adjusted the face closer to the original Predator. 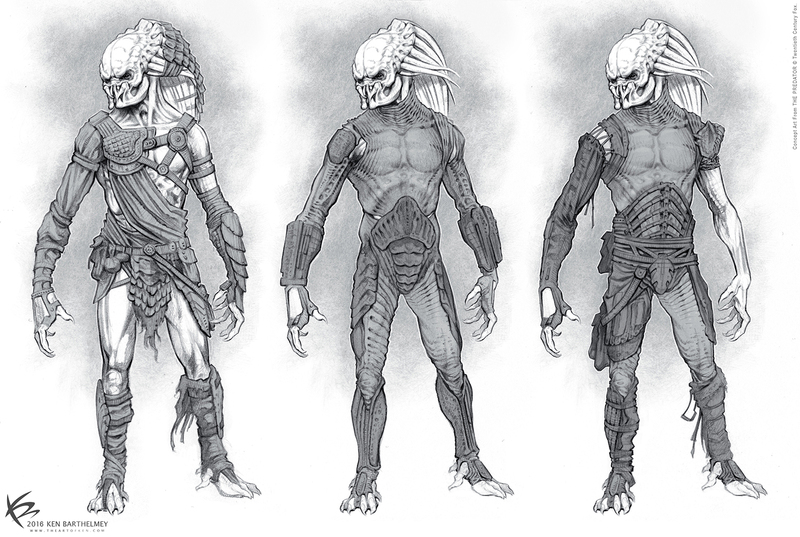 Tom Woodruff suggested to make parts of his clothing translucent, like milky plastic or frosted vinyl, to show the predator’s skin patterns. 3D Maquette, showing the difference between a young Emissary and an old Emissary. 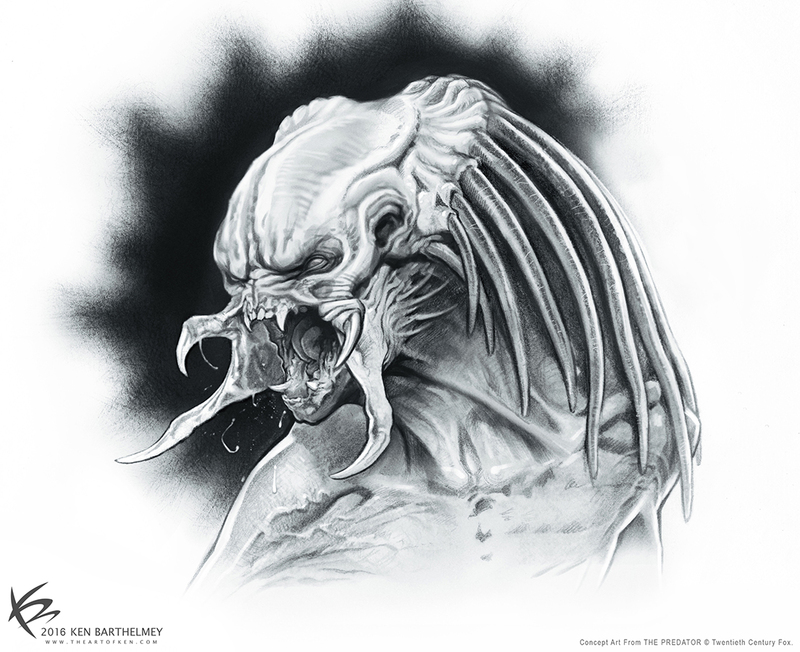 The Upgrade was described as a 12 foot tall next gen Predator. He needed to look bigger, more cunning and more lethal than the other Predators. 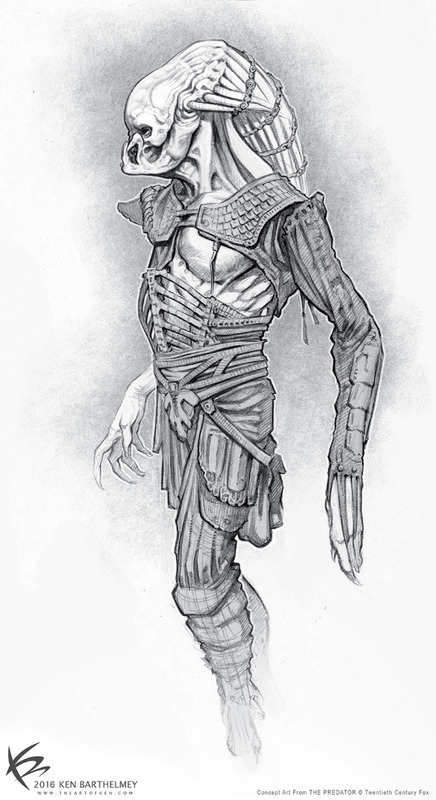 An important aspect was that he has human DNA, because as it turns out the Predators admire the human capacity for dealing death. 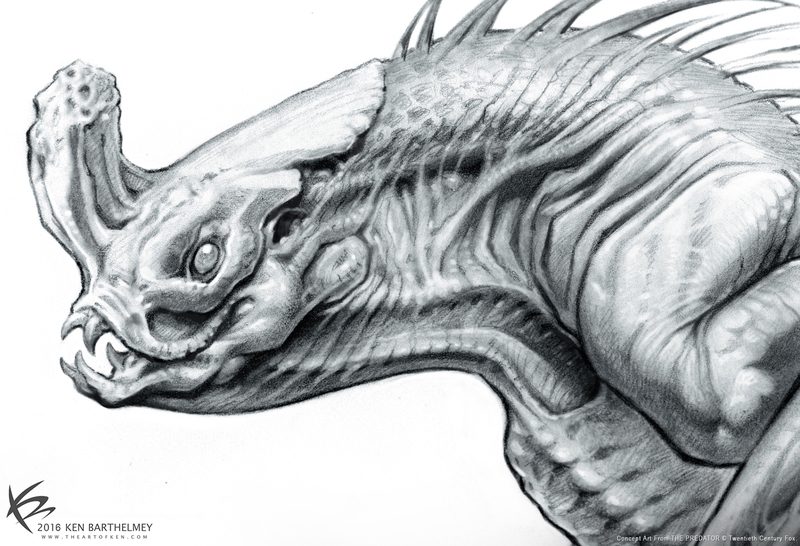 In this early sketch I tried to make him look like a hybrid and gave him some human traits. I experimented with different eyes. 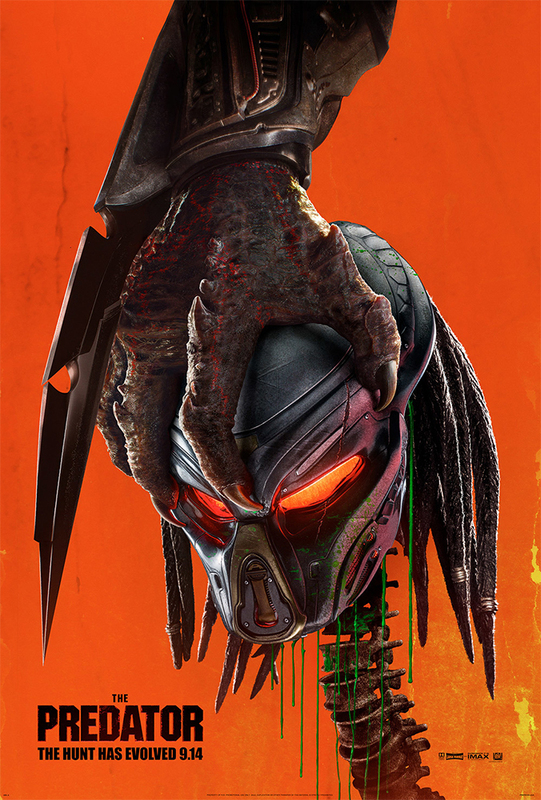 This direction was a bit too far-fetched and too far afield from what we think of as a Predator, but it was a good start base. The director wanted the Upgrade to look more like the original Predator from the first film, but with slightly altered traits. 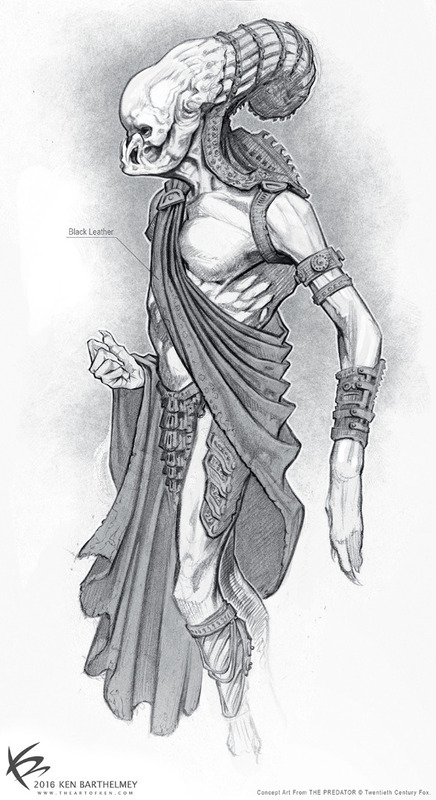 So the challenge was to come up with a new look but which was still reminiscent of the original. I experimented with a few different versions and shapes. 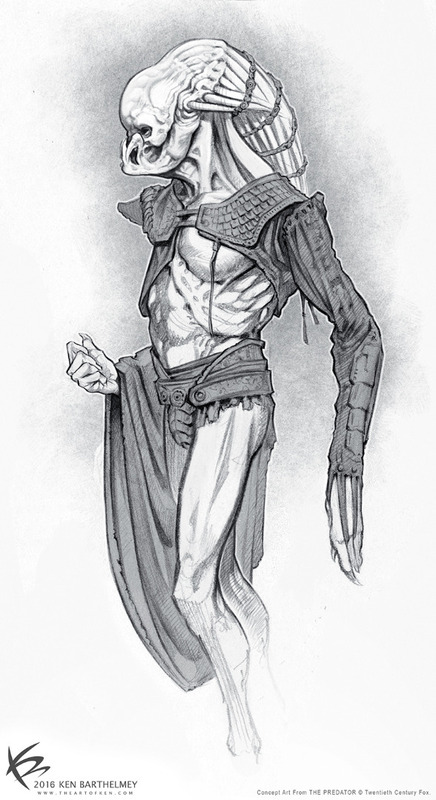 I gave him a few human traits like thin body hairs and more human looking teeth. Strong neck tendons made him look more aggressive. I also added little ears and imagined him with a very pale skin tone. Usage of contents and images are only permitted with written permission of their respective owners. Copyright © Ken Barthelmey, if not otherwise specified.